All our gadgets, mobile phones, music players, tablets, contain computer chips. These chips are powerful enough to store an abundance of knowledge. They are also small enough to allow the majority of our gadgets to fit in our pockets. My work focuses on designing and building parts of circuits for these computer chips to simultaneously give them greater power and smaller size while using less energy. At this moment you are in a warzone of tiny photon torpedoes. They are being fired in your pocket, on the screen in front of you. In actuality photons are blasting your eyes, because photons are just particles of light! We communicate with photons/light all the time. As you read this your eyes are receiving photons and your brain is processing the information. This appears quite a complicated process, your mind has to decide what is text and what is background, and from there piece each letter together and assign the letter with a sound, and then combine all these letters together. Imagine how our brains do that. Can we build something which does the same? Yes, a computer of some kind. Think of the most basic communication we can give: Yes or No. There is an entire branch of mathematics dedicated to these two answers and it was first introduced by George Boole after whom this Journal is named. This Boolean Algebra gives us the tools to break down the information on this page into a collection of Yes’s and No’s in a certain sequence, Figure 1.
: Information can be broken down into a series of Yes’s and No’s (on and off) signals to make transmission easier, and the original information is rebuilt at the receiver. This is possible using Boolean Algebra. Source: Author. And now this is where photons come back in. We need to send our information from one place to another, and we want to do it fast. We could use electricity through a wire. But is there something faster? We can see lightning hit the ground, so that means light travels to our eyes before the lightning travels to Earth. This shows that light is faster than electricity. And all we can do is turn electricity on and off, giving us options for Yes and No. But in fact we can turn different colour lights on, and we can turn it on “tilted” (polarised) in different directions, so we can have more options than just Yes and No; now we can say more. We don’t talk to each other in one word sentences (unless we are in a bad mood) because it’s an inefficient way of transferring information quickly. Our technology turns to the field of light and photons, called photonics, because it increases our vocabulary and allows us to communicate more and faster. We send information to each other using light all the time, a classic example being traffic signals. We can even communicate with Boolean Algebra; by using Morse Code a person across a valley can flash a torch to tell their comrade something immediately, rather than having to run close enough to shout. Within circuits one part has to communicate with another part or else it can’t do anything. The circuit talks to itself much like the person flashing the torch. In a circuit the torch used is a laser, and the laser is used because it is powerful and focused in a direction. Otherwise the light would be too weak to make it across the circuit and would shine the wrong way. Like the torch-wielder there are two options: turn the laser on and off, or leave the laser on and block/unblock the light so that it appears to the receiver that the laser is turning on and off. The latter is faster: leave the laser on and block its laser-light. So for speed we need a laser and a signal generator to block and unblock the light. Clearly if we have the laser and the signal generator separate, then they will take up more space than if they were somehow moulded into a single device. To make our computers smarter we need to pack more things into them, giving them more thinking power. Unless we can make things smaller, computers will have to become bigger as we put more in. Even if we didn’t care about space, what about energy? Whenever we connect different parts together there are flaws (Figure 2). A chair made from separate planks of wood needs screws to keep it together, whereas a chair carved from a single tree trunk is seamless. Whenever we shine light from one thing to another there are reflections at the joint between them so that light is lost and the signal is distorted. Try shining a light out your window; you’ll see the reflection as the light travels from air to glass and won’t be able to see outside clearly. To minimise space and prevent reflections it’s preferable to have the laser and the signal generator seamlessly connected within a single crystal. How does one put a laser and a signal generator into one crystal? Well, have you ever grown vegetables or plants? How about a laser? Lasers are indeed grown! Particles are rained down and they pile up, bonding to each other, growing upwards like a tree. This forms a crystal with layers of different specific materials, and this is a laser. When electricity is passed through the crystal it releases light. The light bounces around in the crystal and grows stronger, coming out as a laser beam. 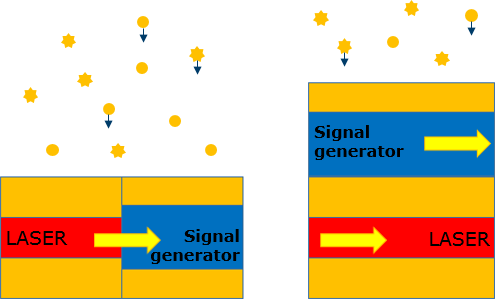 A signal generator is made the same way but with different layers. When electricity passes through it, it either lets the light pass through untouched or blocks it. Currently the laser and signal generator are grown next to each other, joined side by side to form one crystal. 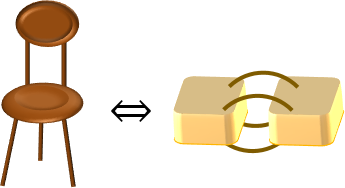 This removes the need to have connections between each separate piece, and as it is one crystal, parts can’t move and break. But growing them next to each other essentially amounts to the same as pushing them up against each other, so there is still the problem of the light reflecting as it crosses from the laser to the signal generator, wasting power. My aim is to develop a solution to the problems of reflections and power wastage while making everything as small as possible. Instead of growing the signal generator and the laser side-by-side, I will grow the signal generator on top of the laser, as illustrated in Figure 3. In this way they should be seamlessly bonded while being completely different at the same time; a bit like the hair on our heads, they are rather different, but they are bonded. Now instead of the light shining in a straight line through the laser part of the crystal to the signal generator part, it needs to go from the laser at the bottom to the signal generator above it (Figure 3). But if you shine light into a crystal it will just go where it wants, like if you shone light into a slab of glass. However we can make light bend from one part to another by shaping the crystal. Even Michelangelo couldn’t sculpt these crystals into shape with a hammer and chisel because they are the size of a grain of sand! Instead the crystals have to be covered in a patterned mask and dunked into beakers of acid to dissolve the exposed sections. Or else tiny electrons can be shot at it to chip tiny pieces off, which is akin to using a machine gun to carve a statue. When part of the crystal is narrowed, it squeezes the light out of it, like a narrowing footpath forces us onto the road. And when part of the crystal is widened the light is sucked in, like a vacuum drawing in air. I must shape the crystal to give light a path from one section to another (Figure 4). Then light can be shone into the lower section where it is in a laser and it gains strength and brightens, before being bended to an upper section where it is now in a signal generator and it is chopped on and off to encode information, like Morse Code with a torch. In a crystal the size of a couple of grains of sand we can have multiple items, such as lasers and signal generators, and we can manoeuvre light, and with it information, between them. And we can put many of these crystals onto a circuit, and place these circuits in, for example, your phone to tell it what to do. So in the future all your gadgets may be talking to themselves, and you, using the computer chips developed here!